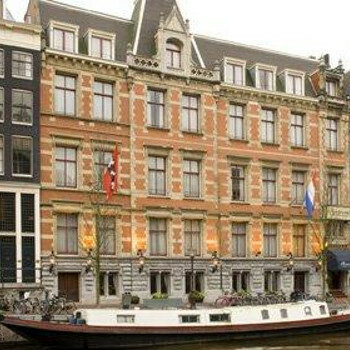 The Rembrandt Classic Hotel is only about 10-15 minutes walk from Amsterdam central station and sits just moments away from the main shopping streets and famous museums. This property is listed on other web sites under different names (Riverview Houseboat, Rembrandt square Houseboat and Romantic Houseboat ). There are some good reviews but if I’d have seen the bad ones including reports of bed bugs, safety issues ,to name a couple I would have not have booked. The owner appears to be re-listing the property under different names on different websites to possibly to escape the bad reviews , so people like myself can’t get a good idea and full picture of the accommodation. The riverboat itself is ok, ( owner has heating locked at a min warm temp) . It was not cold but It never felt cosy . There were issues during our stay which were not resolved after being reported to the owner, to name one; the oven made a loud ongoing ticking noise 24 hours a day for our entire stay, although this was reported no one came to fix the issue. It was also dirty so did not use. The floorboards in certain areas of kitchen bowed 2-3 inches when walked on. Odd smell in lounge coming through floorboards. Another issue with the owner was that 2 of us stayed in the boathouse, 1 slept on the sofa bed and the other in the bedroom (the owner knew of this when explaining the noisy cooker was disturbing our sleep esp at night , more so the person that slept on sofa bed . (the price paid was for use of whole Houseboat as stated on the different web sites ) however on return home he said the cleaners told him the sofa bed had been used , sending me a picture of where the linen should be ( this had been put with other Linen for washing ) This was a bit bizarre as I had already told him about the person being kept awake by noisy cooker ..... for use of sofa bed he would take an extra €30 a night , total €90 out our deposit, thankfully booking.com have reassured me that this is an unauthorised charge. The most ridiculous charge ever €30 for a door handle that had come off apparently while we stayed there , this doorway led to a slippy and unsafe decking which we used twice in our 3 day stay. The owner said I should have reported the door handle , and he would have fixed it , only knowing the handle was looser than a brand new. I did not know it was it was already Brocken. I would like to see Mr universe try and damage a undamaged door handle in 2 goes . Might be a little cheaper than other riverboats (if you get your deposit back ). Would def pay a little more in future for better quality and service. After a bit of a walk with all the bags, we found the hotel, it looks very stylish from the outside, with flags flying and red carpet up the front steps. We were checked in smoothly and to our delight we were given a canal view room as a nice upgrade. The Room was clean and spacious, with an adequate bathroom with bathe and shower. The room was up on the highest floor so the views over Amsterdam were great, and the canal view was great. The hotel is close enough to areas such as Dam square, but far enough out to be away from the real hustle and bustle of the city. The rooms were cleaned every day and towels replaced. We didn’t try the food here, but the dining area was nice but basic. There was a small bar near the reception area. We stayed for the weekend and had a great time and would defiantly recommend this hotel. The hotel was kept very clean throughout, remarkable as the road outside had been dug up leaving only narrow boards over sand to approach the hotel from the nearest bridge (about 50 yards). Sand and dirt were being tramped in all day, and the staff must have worked hard to overcome these problems. However, I did hear them being very offhand to some people at the desk, and on our last day one of the receptionists was less than communicative about how to get our luggage to the taxi through the back of the hotel. The renovation work on the roadway also meant it was really noisy from about 7.30 am. We could have asked for a room at the back, but the view was lovely so we put up with it. They were very helpful about directions to places, ordering taxis, replacing the broken down tv etc. It was otherwise a quiet location, but only 100 yards from Dam Square. We were able to walk to all the places we wanted to get to, though the Heineken museum was a bit of a trek. Overlooked the nicest canal with spire of Westerkirk just behind. The room was a good size, think they vary a lot. The bed was rather a small double, and only 1 rather flat pillow each. There was no safe, hairdryer or kettle in the room. Breakfast was not very imaginative- cereal, cheese, ham, boiled or scrambled eggs, bread, rolls, jam, a few apples etc in a bowl. Some nice fruit and croissants or sweet pastries would have made a difference. A basic room service was available between certain hours ( up till 9.30 pm) but so many places to eat we didn't try it. The bar was hardly ever open. It opened for a couple of hours at about 3pm, and the from about 8pm to 10.30. Not a bad hotel, but there is so much choice in Amsterdam that for the price I'm sure one could do better.